Encrypting your iTunes backup makes it more secure. Unless someone has your encryption password, accessing your personal data will be impossible. 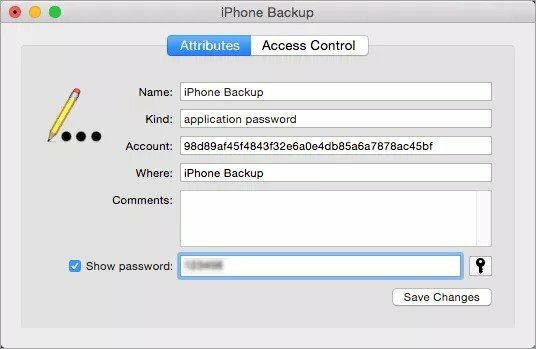 It is not uncommon for iPhone owners to forget their backup password. When this happens, any iDevice owner would want to know if there is a way to unlock iPhone backup password. While it might appear as if it is impossible to unlock iPhone password, it is actually possible. In this article, we will focus on showing you how to unlock iPhone backup password. Read on to learn the top solutions you can use when you cannot recall your backup encryption password. 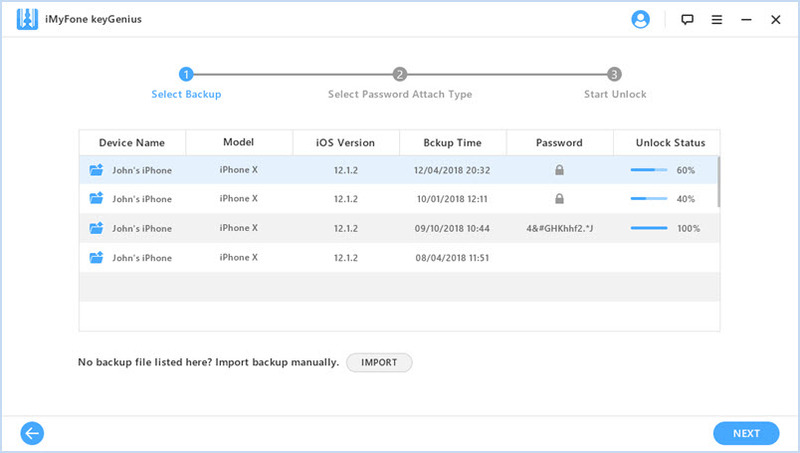 Part 1: How to Unlock iPhone Backup without Password? 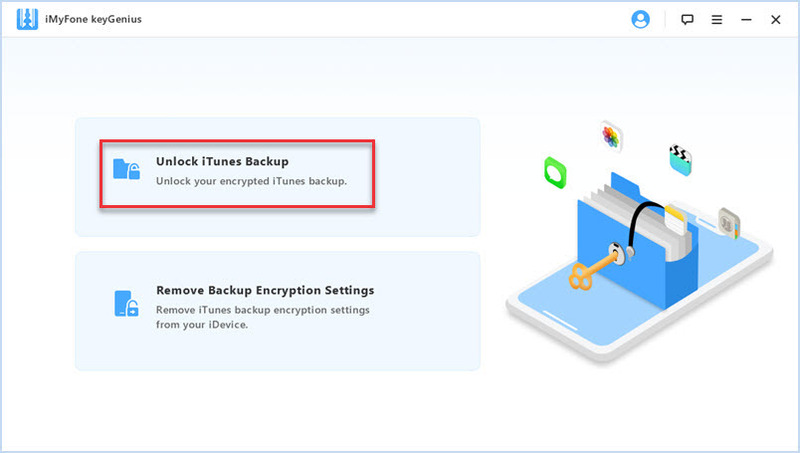 How to Unlock iPhone Backup without Password? The best solution that you can use to unlock iPhone backup password is known as iMyFone KeyGenius. This is the only solution that guarantees you 100% success rate. KeyGenius features 3 powerful attack methods. 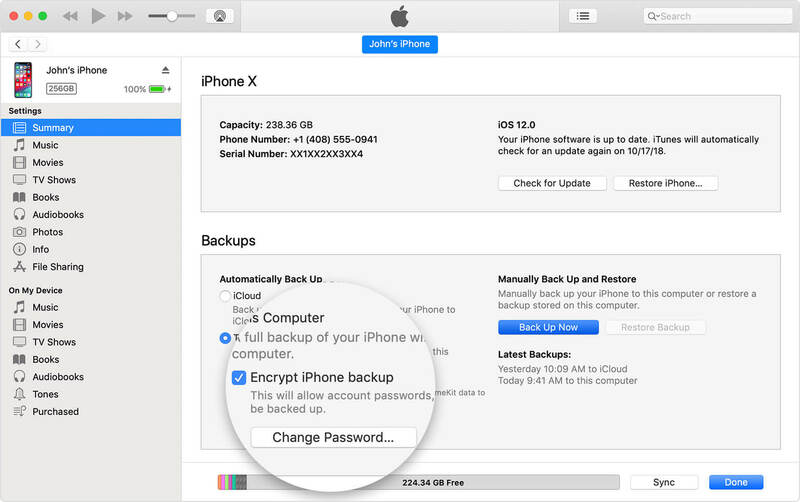 These attack methods can help you either get your iPhone backup password or decrypt your backup without a password. If iTunes asks you to enter a password that you can’t recall creating. If iTunes fails to accept the correct password. If changing the iTunes backup password becomes impossible. If you cannot set the iTunes backup password. iTunes does have some bugs. The above situations are often a result of the bugs. It will make it extremely easy for you to unlock iPhone backup password. 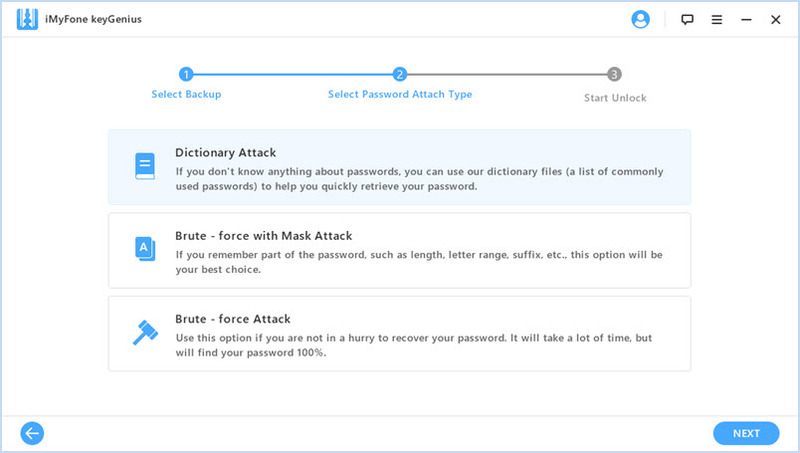 It will make it possible for you to create new backups without a password by removing the encryption settings. Its 3 powerful attack methods guarantee you 100% success rate. 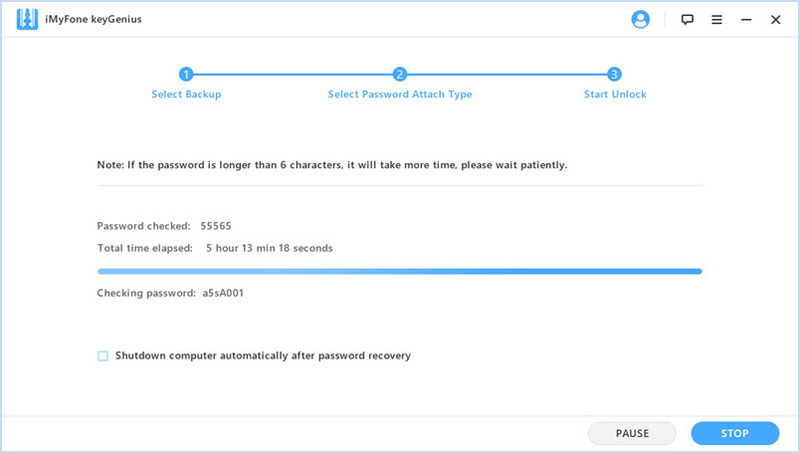 By using removing encryption settings feature, you should be able to create new backups without a password. Step 1: Open the tool and choose "Unlock iTunes Backup". Step 2: Select the backup file whose password you would like to unlock. Step 3: Select the perfect attack type depending on your situation. Step 4: Tap “Start” to unlock the iPhone backup password and kindly wait for it to finish. The best way to unlock iPhone backup password is to use the third-party tool described above. 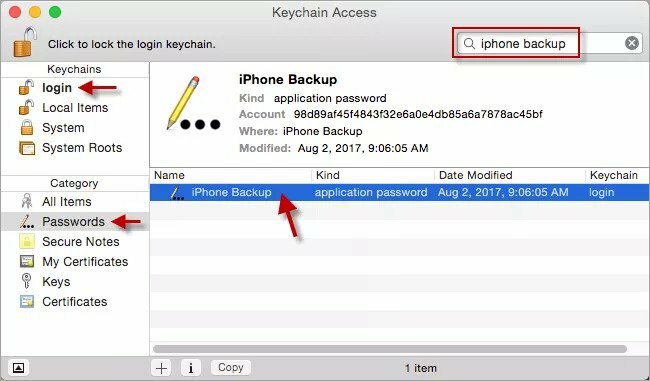 However, if you do have some spare time, you can try the following methods to see if one of them can help you unlock iPhone backup password. Try the iTunes Store password. This is the most commonly used encryption password. Try the 4-digit code you use to unlock your iPhone screen. Try the default password 12345 or 0000. Try using your Windows Administrator password. 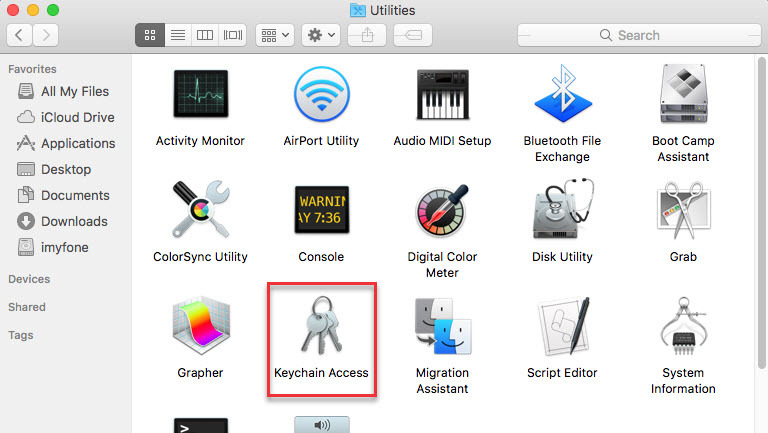 If you do own a Mac, you can try Keychain Access. The Keychain Access is a password manager built into your Mac OS X. It saves a wide range of passwords. If when resetting your iTunes backup password you did select “Remember this password in my Keychain” there is a very high likelihood that you can find the password in Keychain Access. Fire up your Mac computer and visit Finder > Applications > Utilities > Keychain Access. On the top-right corner of the Keychain Access window, click the search box and type “iPhone backup”. In the search results which appear, locate “iPhone Backup” and double-click it. Scroll to the bottom of the dialog box that appears and then select “Show password”. Next, save changes. On the popup Window that appears, enter your administrator password to allow the operation. This should give you access to your iTunes backup password. Note: If none of the methods outlined above work for you, you can use KeyGenius which guarantees you a 100% success rate. 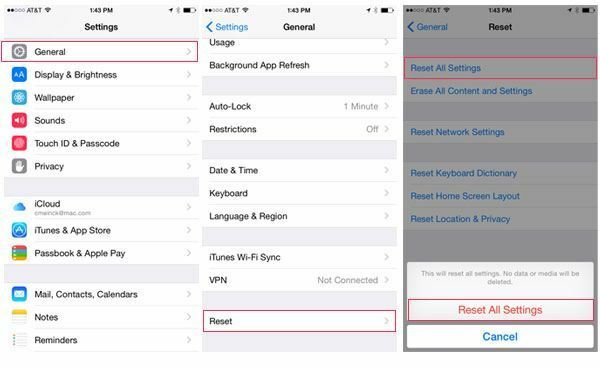 If you want to reset your iPhone Settings and create a new encrypted backup with a new password, here is an easy way. It is important to note that even after resetting your iDevice, you still won’t have the ability to use the old backup whose password you cannot recall. You will only have the ability to use the new backup you create after resetting the settings. On your iPhone, locate the Settings app and launch it. Tap on General and then click Reset. Click Reset All Settings. If prompted for a passcode, enter the passcode you use to unlock your iDevice. This will reset your settings. Connect your iPhone to your computer via a USB cable and launch iTunes. Select your iDevice on the top-left corner and then click Summary. Under Backups, choose “Encrypt [device] backup”. your iDevice. This will reset your settings. Create a password that you can recall and then allow the backup process to finish. If you cannot recall your iPhone backup password, you can use the solutions outlined above. The only solution that guarantees you 100% success rate is KeyGenius. The solution can help you either recover your password or decrypt your iTunes backup without the password. KeyGenius will help you deal with iTunes bugs which may make the Apple service fail to accept the correct password or even ask for a password that you never created.